Ratnagiri is another pilgrimage related to Buddhism, near Udaigiri and Khandigiri caves, and has many significant Buddhist sculptures scattered around in the hill range. The excavations have revealed the relation of this place with the Gupta Dynasty, and this dates back to 6th Century AD. The huge monastery that has been excavated is thought to be of Mahayana sect, showing that Buddhism spread through these areas in the later part, especially due to the influence of the great kings such as Ashoka and those of the Gupta dynasty. There are also some other pieces of Buddhist origin in this place including the monastery, stupas, chaityas etc. 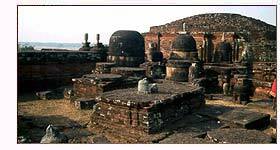 Not only a religious pace, Ratnagiri was also a great place of learning for the Budhism of Tantric cult, known as Vajrayana. The Kalchakrayana also had flourished considerably in this place, as evident from the Tibetan Buddhist texts. Located in Jajpur district of Orissa, Ratnagiri lies at a distance of 100 km from Bhubaneswar, encompassed by rivers in all the directions. The rivers namely, Mahanadi, Brahmani, Kimiria and Birupa cover Ratnagiri from all directions. The stupas are unsurpassable scenery as there are many small stupas around the big one, which makes the circumambulation nearly an impossible task. Various donors who, accordingly differentiated in materials, structure and constructions had donated these stupas. These stupas, numerous and in varieties, portray a vivid picture of Buddhism in ancient India, in its fully bloomed phase. Moreover, they represent the only site with monolithic stupas in such dense manner, also due to the helping hand of the villagers who added stupas from the nearby places into the site. The monastery holds in front of the visitor the splendid past of Ratnagiri, affluent and culturally rich, the proofs could be easily obtained from these delicately built monasteries. The monastery has 24 cells, a spacious courtyard, a shrine in the front and a lobby etc. 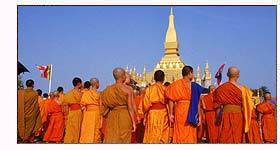 The monastery is a proof of the superlative degree, of the richness, and flourishing of Buddhism in India is still hold high in the sentiments of the devoted Buddhist. The exquisite artistry in the doorframe of the monastery makes everybody spell bound, with its chlorite stones offering it a lovelier finish than the most of the shrines in India. The doorway, with its delicately cut out figures of males and a border of a row of flowers invites everybody to explore in. Or, do they make one stand out of the shrine for more times? The motifs, called Kunjalata and Patralata in Oriya, are representation of the process of cultural transfer and adoption of items from Buddhism as the similar art and style is in Vogue in Orissa, in some parts even in other communities than the Buddhists. The Buddha Sculptures, especially the one in Varada Mudra is worth a close look for its smooth finish and the artistic language it speaks in. Besides this, there are many other sculptures of significant Buddha followers. Langudi hills : At a distance of 93 Km from Bhubaneswar, and with Stupas cut out from rock, the Buddha statue in Samadhi-mudra, Sculpture of Tara, the harmonic umbrella, the Cyllindrical dome, the Langudi hills have become a hotspot for the Buddhist Pilgrims. More so, after fast journeys and heavy schedules, Langudi is ideal for a languid leisure day. Udaigiri and Khandigiri hills : Famous for the caves, these hills provides some solid examples of Jain and Buddhist art of the 2nd Century BC. There are monasteries, Chaityas and stupas that represent a vibrant culture that flourished in these hills. The archaeologically invaluable ancient brick monastery is also a tourist attraction. Besides, the Buddha sculptures and the rock sculptures cut out of the hill also attract lots of people. Jajpur : Situated at a distance of 92 Km from Cuttack, Jajpur is a renowned Hindu pilgrimage situated by the river Baitarini. The tourist attractions include a temple of goddess Durga, Sveta Boraha (the Boraha incarnation of Lord Vishnu), and Sapta matruka. Air : Bhubaneswar is the nearest airport, connected to most major cities in India. Rail : Cuttack is the best railway station within easy reach, at a distance of 70 km from Ratnagiri and well connected with major stations across India. Road : There are good roads from Cuttack, and direct buses run between the two places.